I must say, the Universe has impeccable timing. In the last three days, I was wracked with guilt. In my attempt to find myself and chase my dreams, I had momentarily forgotten my responsibility towards the one person who loved me so much, she sacrificed much of her life for me: my mother. Those of you who know me, know my family story, know that my single-parent mother means a lot to me. And I had forgotten that I had a slowly aging mother who shouldn’t be working so hard, while I was sitting at home picking and choosing assignments to take on so I could enjoy free time. Suddenly my bank account seemed pitiful; suddenly all I wanted was to get a steady job so she didn’t have to work so hard. The fear and worry began creeping in. About two weeks ago I had applied for a community service officer role with an international school, United World College. And while I really wanted it, I told myself not to be attached to the outcome – if it’s meant to be, I’ll get it; if I don’t, it just means something better is coming my way. In the last three days, I fretted about not getting it more. I was due for an afternoon tasting session yesterday and felt really lousy about myself – how could I have forgotten? I should chase my dreams but I cannot forget to make it up to the woman who means so much to me. To let her finally take a break after her years and years of toiling for my family. 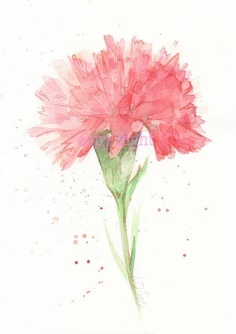 A watercolour carnation tattoo I’ve always wanted to get, to never forget what my mother has done. Walking to the train station, I asked the Universe to send me support in this time of fear and doubt, to give me a sign that they are there. A small support first came in the form of a friend who coincidentally entered the train cabin I was on. The short chat took my mind off things for a while. When I met the marketing folks for the tasting, I left my worries behind too. Then lo and behold, at around 4+ I received the call from UWC. I had dropped them an email about being overseas from today till Sunday and so they were calling earlier. I am so, extremely happy about this. More importantly, it has reassured me that the Universe is looking out for me. They must’ve withheld the call until I got to experience the guilt, as a reminder to never forget again. Like I said – the timing was impeccable. I am so excited about this new chapter in my life. The job opportunity came up out of the blue and while I was initially set on freelancing full-time, I thought of giving it a go because it seemed like a position that could teach me a lot. And here I am :). Just feeling really blessed and thankful now. Plus I’m off to Bali for a semi health retreat! What a fantastic week :).